It was the sort of send-off any jazz musician would have been proud of, let alone one of the UK's leading clarinetists. In Hay-on-Wye, a town best known for its books, about 300 people gathered to pay their final respects to Alan Cooper, who died last month aged 76. Mr Cooper was once with the Temperance Seven trad jazz band, who had a number one hit in 1961. His funeral halted traffic as a band led hundreds of mourners on a parade. 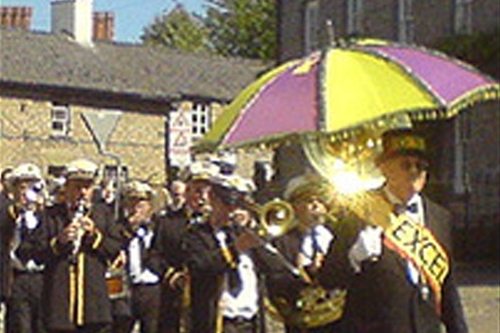 Leeds-born Mr Cooper, a former art lecturer, had lived in Hay for the last 14 years and planned the details of the parade and funeral before his death. The Excelsior New Orleans jazz band, who had played with Mr CoopTown's send off - Remembering Alan Cooperer in the past, travelled from London to lead the parade through the streets. They played a jazz version of the hymn What A Friend We Have In Jesus. But members of the old Temperance Seven also played at the reception afterwards. Friends after the funeral described Mr Cooper, who was playing until a few months before his death, as having a "tremendous sense of fun". Others said he was an avid collector, most notably of old clarinets, vintage cars and Edwardian memorabilia. He was also a dog lover, and owned seven Scottish Deerhounds, which were present at his funeral, along with other dogs. Trevor James, former Wales rugby team manager, was taught by Mr Cooper at St Martin's art school in London in the early 1960s. Mr James said: "He was charasmatic - a larger than life character. He had an attractive personality and a magnetic quality, that's the only way I can describe it. "I remember Alan looking through my work once and he threw the pictures on the floor. I thought 'what's he doing', but that's the way he was, an extrovert and slightly eccentric, but very warm." Father Richard Williams, who conducted the service at the church of Mary The Virgin, said he was a "multi-faceted person, who had many qualities." Fr Williams said Mr Cooper loved God and had the capacity for love and great affection. After the service, a reception was held in a local park, with the jazz band providing the music. After leaving school, Mr Cooper attended art college and later went on to play in various jazz bands, including the Temperance Seven, who had a number one hit in 1961 with You're Driving Me Crazy. The group, who wore Edwardian clothes on stage, also featured on BBC TV, including the comedy programme, Galton and Simpson's April 8th Show, starring Peter Sellers.